The story that started it all reveals a titanic ancient being trapped below the sea, biding its time until the stars become right for it and its hordes to rise and reclaim this planet. 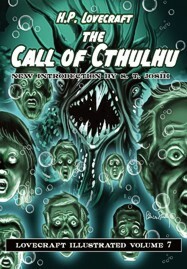 The Call of Cthulhu. By H.P. Lovecraft, illustrated by Pete Von Sholly, introduction by S.T. Joshi. Hornsea, England: PS Publishing; 2015; ISBN 978-1-848637-37-5; jacketed hardcover.